Last week, after going back and forth on how to use some leftover Spicy Shredded Beef, I decided to make my first Beef Pot Pie. Some of you may remember that I made my first Chicken Pot Pie last winter. Just like then, I asked for advice from my dear friend Lisa (from Extraordinary Life). Her suggestion? Follow the same basic recipe that I used for Chicken Pot Pie, but trade out the chicken and chicken broth for the shredded beef and beef broth. The result? Mmmmmm! I already LOVE the Spicy Shredded Beef recipe from Cutting Back Kitchen! In fact, we enjoyed it twice this summer already! 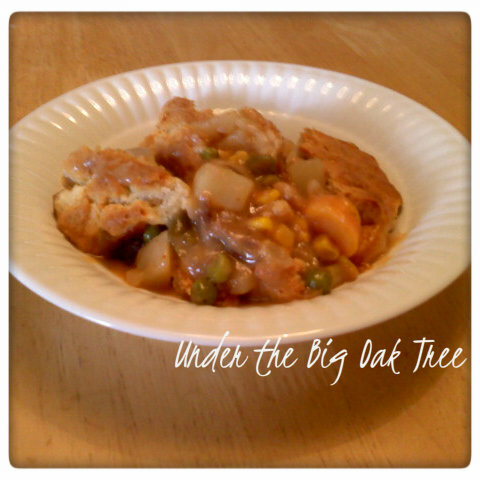 Now, I'm looking forward to preparing it again so that I can make this pot pie with the leftovers again! I'll be keeping a look out for a sale on roasts! Melt butter in the same pot used to cook the potatoes, onions and celery. Add flour, milk and broth, stirring constantly until thick and bubbly. Stir in salt, pepper, shredded beef and vegetables. Top with pie crust. Cut slits in the pastry to allow steam to escape. Bake in oven for 20-25 minutes or until crust is golden brown and filling is thick and bubbly. Sure, this definitely isn't a traditional summer meal, but it was a great way to stretch that leftover shredded beef! I love frugal meals like this one and now after this tease, I'm really starting to crave soups, stews and pot pies! Can't wait to make this again! Are you interested in joining me in a Decluttering Challenge? Follow the link to learn more!